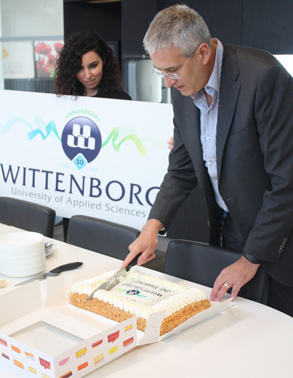 This week Wittenborg University of Applied Sciences officially turned 30 years old! 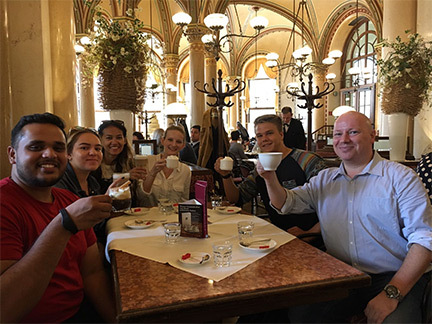 Students and staff celebrated the milestone event on Thursday at its 3 European locations in Apeldoorn, Amsterdam and Vienna. A formal celebration will follow on 10 November, with a gala evening at the Apeldoorn city hall, in the company of stakeholders from the business community, government and diplomatic circles, befitting its international status. Many well-wishes were received from around the world. In Apeldoorn the celebration was headed by the chair of the executive board, Peter Birdsall, while in Amsterdam it was CEO Maggie Feng who cut the specially-made logo cake, and in Vienna, director Dr Alexander Bauer led the toast. 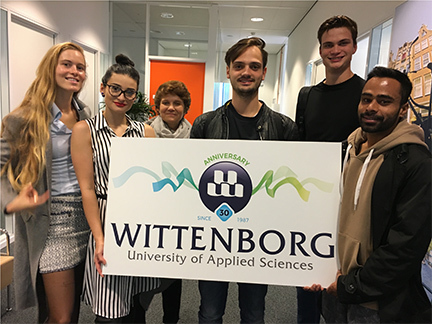 A special Birthday Newsletter was issued detailing the university's growth over the past 30 years, from starting as Wittenborg College in 1987 in Deventer, to becoming one of the most international institutes of higher education in the Netherlands. It also gave an insight into how Wittenborg has solved the question of providing accommodation for its incoming international students over the years, the different buildings it occupied and what lies ahead for the university. Birdsall said the gala will be "an incredible evening" with food, drink and live music. He encouraged international students to show off their countries' traditional clothes and their finest evening wear.